So I'm sitting at the table having my Cheerios (see post below) and totally enjoying the sunshine of the first day of fall. It splashes over the table and everything on it. I have to take a bunch of pills every morning. Most of them are vitamins, but it's still a lot. I have the sewing machine set up to finish the curtains and to progress to Christmas presents. I'm already thinking that far ahead. I have all this fabric. Oh! I know what I can make. Inspiration comes from everywhere. 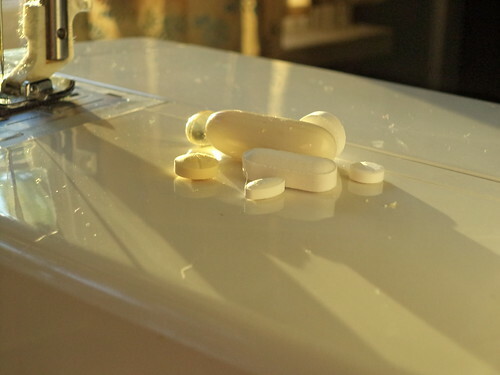 I put my pills on the sewing machine and the sunshine caught them. The various colors of cream and white are quite interesting to me. There's the cream-clear gel of the vitamin D in the back and the cream of the round folic acid in the front. And the white of the diuretic and the zinc and magnesium. Contrast that with the stark white of the sewing machine and the lightly gold tinged sunlight. There's beauty in everything if you just look. You could say it makes taking all of these an exercise in art consumption. 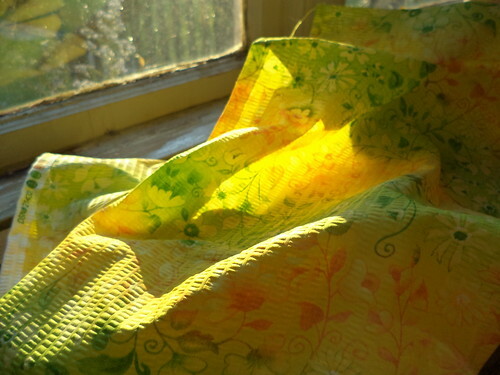 The sunlight also illuminated the curtains on the table. Look at how the fabric glows. This is exactly what, in my mind's eye, I wanted for Carole's side door. I wanted sunshine and happiness and color. The side seams are stitched and tonight I will pin and sew the top for the rods. The fabric is quite stiff and will hang beautifully. Now I'm thinking I should make curtains for my house. I have rooms that would benefit from a sprucing up of new curtains.